A High-quality plumbing was necessary to people ... about since its inception. In the 21st century nothing has changed. People are accustomed to comfort and extremely do not want to be deprived of comfortableness. 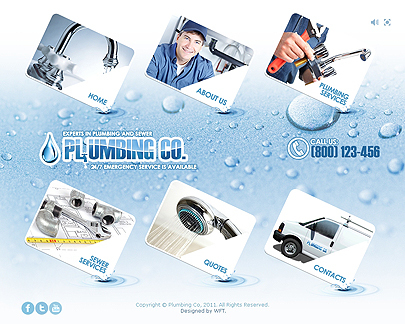 That is why nowadays such profession as experts in plumbing repair remains extremely popular. However, now offering of such services gradually moved to the Internet. And our theme templates will help you to freely contend with competitors. 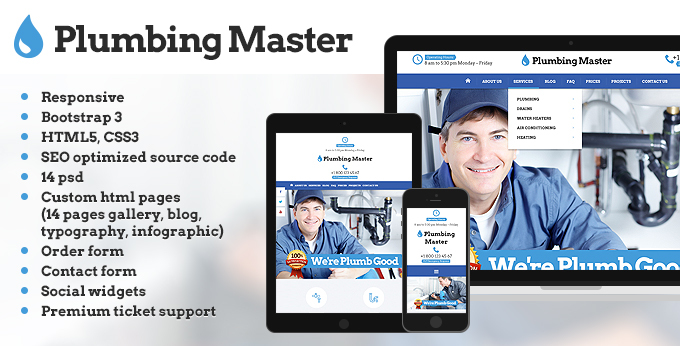 Plumbing master website template. The main page that appears when scrolling through (There is the impression that its elements creep out outside the screen), focuses the user's attention on the available information. Changing pictures serve the same purpose - a process of change resembles the action of a jalousie. This template is made in a uniform color scheme, which does not cause eye strain, and in addition, emphasizes the "water" company activity. Selection of fonts, seeming at first sight too traditional, just justifies itself, because nothing should distract customer who came to the site. There is a special principle of information’s arrangement for this purpose: it is served not as a whole thing, but as compact unit to help a view clung to one of them, and smoothly transit to the other. Plumbing. This template is characterized by original design - creation of the effect of presence. Drops of water not only fill in the background, but flow down the screen and accurately exhibit the specifics of the work. Menu items, which placed under an unusual angle, are accompanied by colorful pictures and inbuilt animations that allows you to select the desired item accurately. In addition, transitions to other pages are also accompanied by interesting animations - menu items “move apart” and a waterfall washes away the old block of information, giving place to a new.